﻿ Using Stones for Personal Growth. Green Tourmaline or Unakite: Freedom of Conviction. Green Tourmaline, also called Elbaite (named for the island of Elba), or Verdelite (from the Italian and Greek for "greenstone"), is a transparent or translucent crystal that gets its color from its lithium and iron content. It comes in many green shades and usually forms in long needle-shaped columnar crystals with well-defined striations parallel to the main axis. Tourmalines are usually easy to identify because of their striation. Green tourmaline is mined in Maine and California, as well as in Brazil. 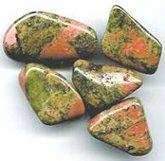 Unakite is another stone that puts out the same type of subtle energy as green tourmaline, and can be used as a less expensive alternative to green tourmaline if desired. Unakite is a medium to light green opaque stone with areas of dull pink color on its surface. It is composed of quartz, green epidote and pink feldspar. It is named after the Unaka Range of mountains, part of the Appalachian mountains, where it was first discovered. It is often cut into cabochons to make belt buckles, ties, pins and brooches. 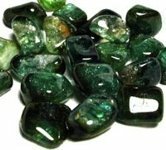 Green Tourmaline (as well as Unakite) acts on the inner self to strengthen Freedom of Conviction. This is the freedom to choose what to think and believe. It is the freedom to have your own opinions, to think and believe what you want, in spite of any pressure from others to conform to their beliefs. It is the freedom to agree or disagree with the opinions, viewpoints or beliefs of others. It includes the freedom to choose how much to let others influence what you believe, if you let them influence you at all. If you have a strong freedom of conviction, you are your own person and make up your own mind about things. You are good at controlling how much to let others influence you, and you know how to resist being manipulated by others. Freedom of conviction comes from understanding at a deep level that it is a basic human right to choose what to believe, to have your own opinions, and not let yourself be manipulated by others. Every human right has two sides to it, namely the right as it applies to you, and the right as you must let it apply to everyone else. And to be fair, the right must be the same for both. The consequence of this is that you have the right to freely choose what to believe without unwanted influence or manipulation by others, and others have the right to freely choose what to believe without unwanted influence or manipulation by you. The obligation side of this right could be called non-manipulation. It is the obligation to allow others their freedom of conviction, to allow them to freely choose what to think and believe. It is the obligation to not try to manipulate people or otherwise use deception to influence them in a way that, if they knew what you were doing, would be against their will. You understand that people have the right to freely choose what to believe without unwanted influence or manipulation by you. For this reason you allow people to have their own beliefs, viewpoints and opinions without trying to manipulate them into seeing things from your point of view. To be empowered to truly think and believe what you want, you must not be afraid to stand up to persuasive or convincing people who try to manipulate you into seeing things from their point of view. If you have a strong freedom of conviction, you are your own person and make up your own mind about things. You are good at controlling how much to let others influence you, and you know how to resist being manipulated. If you are good at holding on to your convictions, you are also good at seeing through people who try to deceive you or manipulate you into believing what they want you to believe. For example, if someone gives you a gift, you can usually tell if that gift is freely given, or if the giver has an ulterior motive in giving it. If you are good at seeing through manipulation and deceit, you are also good at seeing people's true intentions. Seeing people's true intentions can also be a real advantage whenever you have to negotiate in any way. Negotiation to reach an agreement or make a deal is one area where people commonly try to influence and manipulate each other. For example, in trading in your car, your opinion of its value may be much higher than the salesman's opinion. Since no deal is made unless you can agree on a value, negotiation can sometimes be a difficult and drawn out process. Keep in mind that you have the right to believe your car is worth a million dollars, but you won't sell it unless you find someone who agrees with you. If you have trouble holding on to your own convictions, people tend to take advantage of you. They sometimes deceive you or manipulate you by using duplicity, bribery or flattery, or by withholding information from you, or by putting themselves out to be something they are not. You don't like having to negotiate deals because it is too easy for others to make you feel guilty, and this makes it almost impossible for you to drive a hard bargain. One of the best ways to strengthen freedom of conviction is to learn to operate your life so you no longer need to deceive or manipulate people. To help with this, develop a concern for "the big picture", a concern that makes you want to respond to the needs of the larger group. Nourish the desire to do what is good for everyone. When you can do this, there is no need to deceive or manipulate people during negotiations or at other times, because you are truly trying to work things out in a way that is good for everyone. You can reveal your true motivation because you just want what is best for all concerned. You can also expand your freedom of conviction by becoming more aware of how receptive people are to knowing what you think and believe, and how ready they are to accept what you believe. When you understand how much someone can accept about you, you know how candid you can be with him. You can then give him enough information about yourself to satisfy him without deceiving or manipulating him, and you can limit it so you don't get into an argument about beliefs and convictions. Also, the ability to be good at choosing what to believe comes from knowing what is credible or believable in life. To help with this, become more acutely aware of what to believe about information you get from others, and what to believe about who people are inside. When you have a good idea of what is truly credible, it is easy to make strong commitments to yourself to believe in those things.